In an earlier post I wrote about the LCROSS mission, which is due to make its crash landing on the moon on October 9. (Mark your calendars!) 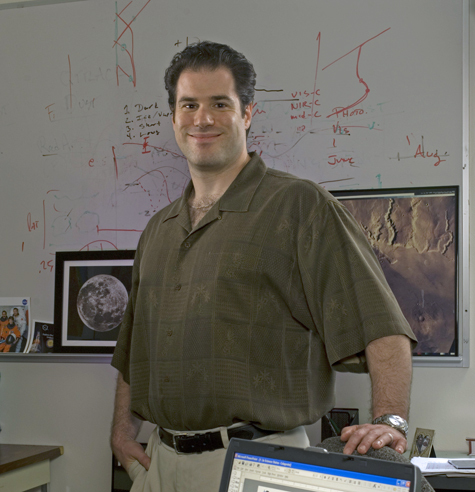 In July I talked with Tony Colaprete, the Principal Investigator for the mission. 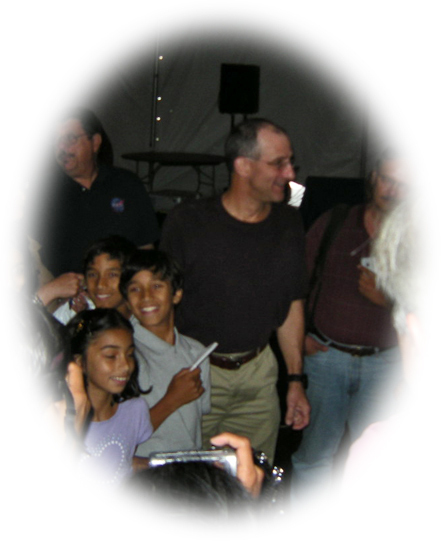 I apologize if there is a bit of unevenness in this interview, because I have cobbled it together from three sources — our conversation at the Moon Fest, an e-mail, and his presentation at the Lunar Science Forum. Answers have been edited for length but I have tried to preserve Tony’s wording. DM: You told me that you were born the week before the Apollo 11 landing. So, happy birthday! How big an inspiration have the Apollo missions been to you? TC: I was born July 16, 1969, the day Apollo 11 launched. My father was heavily involved in the Apollo program, and one of my early childhood gifts was the classic Snoopy dressed in an EVA suit. So, yes, the Apollo mission was a huge influence, not only because they were so amazing but also because of my father’s involvement. … I am amazed to think that the folks who did Apollo were on average around 25 to 27 years old! The commitment, devotion, and guts those people had is inspiring. I just hope I can do things half as right as they did for the Apollo program. DM: When and how did you decide that you wanted a career in space exploration? How did you prepare for it? TC: When I graduated from high school I knew I wanted to either go into the sciences or art. Luckily for us all, I decided to go into the sciences. … Very early on, though, I loved being in the woods near Boulder, Colorado, where I grew up. I would go for hours by myself and just watch what went on around me. So very early on I knew I loved systems, how things work together and influence each other … I still do. I worked on instrumentation at the University of Colorado through the Space Grant College and the Laboratory for Atmospheric and Space Physics for a few years after getting my bachelors degree in physics. I was taking a few graduate classes (including my first planetary atmospheres class, taught by a very inspiring David Grinspoon), when I realized I wanted to pursue a graduate degree in planetary sciences. Luckily, CU is a great place to do that! While I was doing my graduate work I continued to work on instrumentation for sounding rockets, space shuttle flights, and small spacecraft. This combination of science and engineering (again, systems!) was key, I think, to helping me get where I am now. DM: How did the idea for the LCROSS mission come about? TC: When LRO moved up to a bigger rocket, they had room for an extra 1000 kilograms on board, and a call for proposals went out for a co-manifested mission. And by the way, they said, you have only 2½ years to get it done, and you can’t spend more than $80 million. 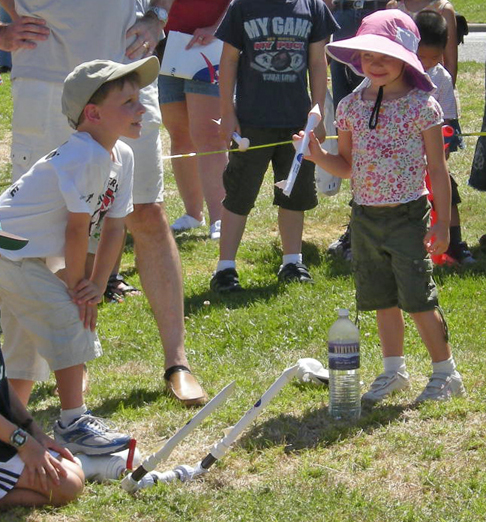 When the call was announced, we [at NASA Ames] formed a “Tiger Team” to come up with ideas. Early on in the process we considered an impact mission, but I concluded that with only 1000 kilograms to work with, the impactor mass would be too small. Another person in the group, Geoff Briggs, suggested using the spent upper stage of the launch vehicle. He has since said that he got the idea from someplace else. I ran some numbers and convinced myself that an impact by an object of about 2000 kilograms would produce a cloud observable from earth. At about the same time, Northrop Grumman submitted a [proposal] that was also using the upper stage and also had a small shepherding satellite that could make observations. An engineer on the Tiger Team saw the idea and told me about it. We had a couple Northrop Grumman scientists come up and we discussed our ideas and the rest was history. So I don’t think it was any one person’s idea, but just enough people with the same idea! In the end, LCROSS was selected out of 17 proposals. We cheated the 1000 kilogram limit — it’s 3200 kilograms, because we held on to the spent Centaur [rocket stage], which is about 2300 kilograms. DM: Have you ever watched a launch in person before? If so, how was it different, knowing that it’s your own experiment that is going up? TC: I’ve flown payloads on sounding rockets and shuttle flights, and have seen those go before. This Atlas moved so slow at first! I thought to myself, “You’d better pick up some speed or you’re not going to make it!” The sounding rockets and the shuttle use solid fuel, whereas the Atlas V is all liquid — it’s a big difference! My biggest concern at launch was whether we could get off on the 17th or the 18th [of June], because those two days result in very good impact observing conditions for the continental U.S. The 19th was not so good, and on the 20th [there were no good times] at all. So I was very glad the weather broke in time for us to go on June 18. DM: Have there been any exciting moments since the launch? DM: What are you expecting to see when LCROSS hits the moon? TC: There are a couple different models of how the water gets to the south pole and two different predictions for how it is distributed. We describe them as the smooth versus chunky models. In the smooth model, the ice is uniformly distributed on the scale of this room, with about a 1 percent concentration of ice. If that model is correct, LCROSS will have very good chances of detecting it. LCROSS should be sensitive down to concentrations of half a percent. However, if the ice is chunky, with smaller pockets of up to 10 percent ice, then we might have a 10 percent chance of hitting something. If we hit one of the “peanuts” in the chunky peanut butter, we’ll know. This would immediately distinguish between the two competing models. My biggest fear is that we won’t see anything — that it will be a dud. But even in that case, then we’ve learned that the distribution isn’t smooth. That is important to know, because it means that your next mission [i.e., a lander to search for ice on the ground -- DM] had better be mobile. DM: How does the LCROSS mission compare with other spacecraft that have crash-landed on the moon (Lunar Prospector, the European SMART-1, and the Japanese Kaguya)? TC: None of those other missions were designed as impactors. The biggest difference is that they typically hit the moon at a low, grazing angle, because they were in orbit around the moon. LCROSS is not, it’s in orbit around the Earth. [This is a rather non-obvious fact that is illustrated on the flight director's blog at this link. LCROSS doesn't "go to the moon." It goes into an orbit around Earth that is the size of the moon's orbit, and then the moon just runs into it! - DM] So it will hit at a very steep angle, around 85 degrees. Also, we’re bringing quite a bit of mass. So those missions can’t be compared to LCROSS for visibility, size, and impact angle. DM: How big a crater will the LCROSS impact make? TC: We’ve done simulations using Apollo-era technology, and we expect the crater to be about 20 meters wide — the size of a tennis court. We expect the plume to contain about 300 to 400 metric tons of material. DM: On the LCROSS website you have a list of several possible target craters. Do you have a favorite on this list? TC: Faustini would be my preference. It’s a very old, large crater, so the material in there has been in shadow for a very long time — around two and a half billion years. We want to hit somewhere that is flat and fluffy, not blocky and steep. One thing against it is that it’s right on the limb of the moon. So the ejecta have to go up 2 kilometers in order to be illuminated by the sun. 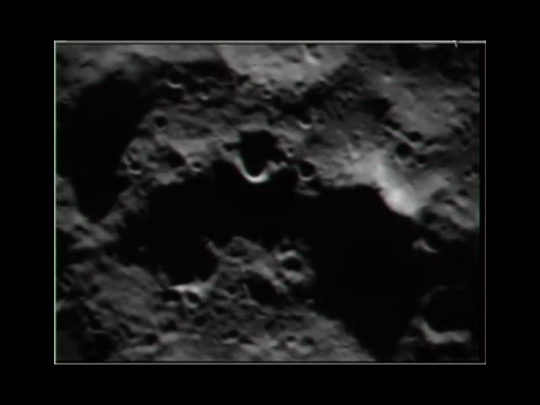 In some of the other target craters, the ejecta only have to go up about 500 meters. But for earth observers, a position on the limb means that you get high contrast [against the darkness of space -- DM], and that’s good. DM: I think it’s interesting how you have been able to use the results of other recent missions to narrow down the list of targets for this mission. Can you talk a little bit about the synergy between missions, and especially the Japanese Kaguya spacecraft? TC: The topography from their laser altimeter has been invaluable. First, it lets us calculate the slope of the ground. You don’t want to hit a slope [because you would then lose the benefit of a high impact angle -- DM]. Kaguya also gave us amazing information on the depth of the craters. Some of the errors in the previous estimates were significant, on the order of 500 meters to a kilometer. From the Kaguya terrain camera we got information on the surface roughness and albedo [reflectivity] of the craters. So, overall, they matured our current data set. Also, with new LRO data coming online, we’ll be refining our numbers continuously to make the wisest choice of target. We will finally make an impact site selection by 30 days before impact, roughly the first week of September. DM: How can ordinary people contribute to the LCROSS mission? TC: Amateurs have already contributed, and with an impact with the moon high and the skies dark as far east as Texas, I hope many more will continue to contribute. One thing to realize is that professional astronomers typically don’t point their telescopes at the moon. To most of them, the moon is a source of light pollution. So when we asked the best in the world to look at the moon for a change, there was a steep learning curve. One thing they needed to learn was how to find the crater you want to point to amongst a hundred or so other craters that look very similar. The shadows and bright areas change dramatically with small changes in the sun angle, so finding one’s way around the moon can be difficult if one has never looked before. To help, we asked the amateur community to image the moon at all phases and tilts so that we had a library of sorts for the various light conditions. DM: Finally, do your kids know that “Dad is a rocket scientist”? If so, are they proud of it, and are they paying any attention to the LCROSS mission? Hmmm… I can see some puzzled looks out there. Okay, I’ll explain. LRO is the Lunar Reconnaissance Orbiter (LRO), which launched on the same rocket as LCROSS on June 18. BFF is Internet-speak for “best friends forever.” (But you knew that already, right?) And October 9 is D-day for the LCROSS mission. 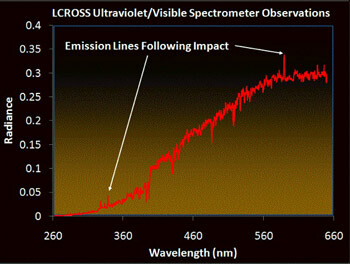 Unlike LRO, which will accumulate its results slowly and steadily over a period of one to three years, LCROSS will go out in a blaze of glory, and will do all of its most interesting science over the course of 5 minutes. LCROSS consists of two main pieces — a spent rocket booster and a “shepherding satellite.” On October 9, around 4:30 AM Pacific time, the bigger rocket booster will slam into a crater near the moon’s south pole. Imagine an SUV crashing head-on into the ground at more than 5000 miles per hour! That’s what the impact is going to be like. It will be equivalent to the explosion of about a ton of dynamite. The explosion will be big enough, in fact, to be seen from Earth. That is the whole idea — to time the impact so that it can be tracked by all of the big telescopes on Hawaii, as well as the Hubble Space Telescope. Colaprete says that even a 10-inch telescope (well within the range of many amateur astronomers) should be able to see the flash, if it is pointed in the right place at the right time. If you don’t have access to a 10-inch telescope, you can also watch the impact over the Internet. A minute or so after the big kablooie, the shepherding satellite will come swooping in, flying right through the debris plume. While it’s getting buffeted about, it will hopefully be able to sniff out any volatile compounds that have been excavated by the blast, including water vapor — the number one target of the mission. We’ve seen tantalizing hints of water ice from orbit, but nothing that absolutely confirms it. We know that there is hydrogen in the permanently shadowed craters near the south pole, but there is no guarantee that the hydrogen is bound up with oxygen to make a water molecule. There’s only one way to find out for sure, and that is to “reach out and touch it,” as Colaprete says. Or perhaps “reach out and blow it up” would be a slightly more accurate wording. After it flies through the plume, the shepherding satellite will itself crash into the moon a few minutes later, creating a second and smaller blast. Colaprete is deliberately not building up any great expectations for this one, because it will be harder to control where the shepherding satellite lands. However, it will give scientists a second chance to look for signs of water, or at least to understand the mechanical properties of the ground that LCROSS is crashing into. Last month I had a chance to interview Colaprete by e-mail and then in person at the Moon Fest. I also went to his talk at the Lunar Science Forum. In my next post I will try to reproduce these three “conversations” as if they were all one interview. By the way, the LCROSS mission reminds me of something interesting I learned when researching my moon book. After Russia launched Sputnik in 1957 and when our scientists and politicians were debating what we could do to respond, one of the crazy ideas that was floated was to nuke the moon. That’s right, launch a nuclear missile at the moon and blow it up, thereby proving somehow that we were bigger and badder than the Russkies. What a stupendously bad idea this would have been, because we would have learned nothing from it. The response we chose instead — sending men to the moon — was vastly more difficult, but we got so much more out of it, including a real understanding of the moon’s origin and makeup, plus the fleeting goodwill of all of the rest of the world. A spent rocket booster is not a nuke. The LCROSS mission was designed with a specific scientific purpose in mind: to excavate water ice, to see first of all if there is any ice there and secondly how much there is and how easy it is to get it out. These are vital things to know if we are ever going to set up a permanent moon base. Maybe these points are obvious and didn’t even need saying, but I just wanted to explain why the LCROSS mission is not just about some engineers blowing things up for fun. A colder and wetter moon? Yesterday I went to the Lunar Science Forum at Ames Research Center, which was the scientists’ version of a Moon Fest – a chance for all the recent and current moon missions to unveil their latest and greatest findings. According to the organizers, more than 500 people registered, including 200 just since last Friday. I don’t think that all these people actually came — the main meeting room holds 300, and it was not filled to capacity. Nevertheless, it was a well-attended (and well-Twittered) event. All of the LRO results are very preliminary, because LRO is still in its “commissioning orbit,” when they are still warming up and checking out the systems. By the way, I mean warming up quite literally. Most of the instruments have residual moisture in them from their time on Earth. (So do most tourists, after a few hours in the humidity of south Florida!) So they have to go through a “bake-out” period to dry out all of that extra moisture. The LRO camera finished its bake-out on July 10, but even before then (as mentioned in this entry) it started sending back fabulous pictures. Also, scientists from two other moon missions spoke yesterday. There was one presentation on the Japanese Kaguya mission that just ended a week before LRO lifted off, and three about the Indian Chandrayaan-1 mission that is still ongoing. The most interesting news yesterday all had to do with results that we can’t really talk about yet! One of them is so preliminary that no one can really interpret it yet. The other two are results that are going to be published soon but are currently under “embargo,” meaning that the scientists aren’t supposed to talk about them until the publications come out. 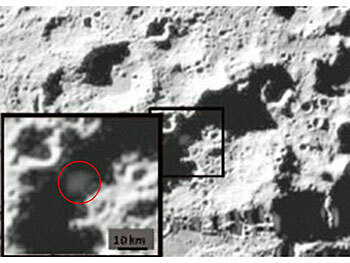 First, David Paige, principal investigator for LRO’s Diviner experiment, showed some of Diviner’s first measures of the temperatures in the moon’s permanently shadowed craters. Remember that these are supposed to be “cold traps,” where water molecules could perhaps accumulate as ice because they are too cold to float away. The first temperature readings in Amundsen crater turned out to be even lower than expected: around 33 degrees Kelvin (or 33 degrees above absolute zero). From his wording, you might correctly infer that Paige is not really sure this measurement is right. The instrument has been calibrated, but he said there are some possible reasons why the instrument-measured temperature may not be the same as the physical temperature. (For example, they don’t really know what kind of surface they are looking at — rocky or soft and fluffy — and that can make a difference to how they estimate the temperature.) The instrument is still too fresh and new, and the finding too unexpected, to put a lot of stock in it yet. But what it could mean is that the permanently shadowed craters are a better cold trap than we thought. Mini-SAR is also looking for water ice; the idea is that ice will reflect a circularly polarized radar beam differently from rocks. (The radar wave will actually go into the ice before bouncing back, because ice is transparent.) This is similar to the way that ice was first detected at the south pole, by the Clementine mission in 1994; Spudis was the deputy leader of the Clementine science team. However, the Clementine satellite only got one brief peek at the south pole, and so its results were very ambiguous. You can’t do very much in science with one data point. Chandrayaan-1 should do much better. We will have to wait to find out just how much better it’s done. Nevertheless, I will transcribe a fascinating exchange that occurred during the audience-questions period after Spudis’ talk. Clive Neal, the chair of NASA’s Lunar Exploration Analysis Group (which advises NASA on the choice of moon missions) went to the microphone. SPUDIS: You don’t know that! (Laughter.) You’re making an assumption, and maybe it’s warranted, maybe it isn’t. SPUDIS. No! (Laughter.) But you’re welcome to draw whatever conclusions you care to. NEAL: Can I just rephrase the question? If I buy you a beer, would you comment? DAVID MORRISON: I think all of us are beginning to assume that in a month or two we’ll have a wetter moon than we do now. SPUDIS: Well, the moon isn’t going to change. (Laughter and applause.) Our perceptions might change. But, you know, some of us have had this perception for a long time. Make of it what you will! Just don’t blame me for breaking any embargoes. These roads are so confusing. 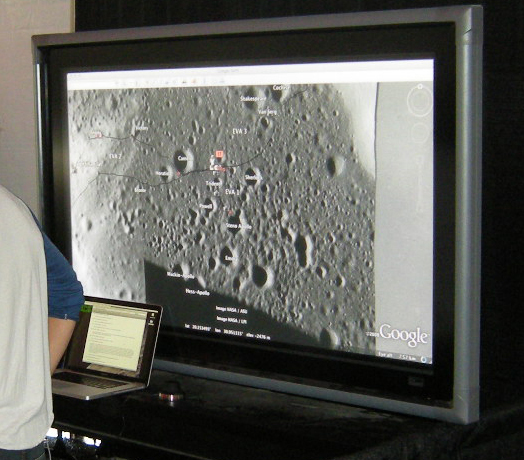 Google released its new version of Google Moon on Monday, and there was a large screen in the tent demonstrating it. It’s a huge improvement over the previous map-based Google Moon. This one has all the latest imagery from the LRO mission, and will continue to be updated constantly — so look for it to continue improving by leaps and bounds over the next year. The LRO launch was perfect, and that is very good news for the scientists, because it means that there is more fuel left for an extended mission than they could previously count on. Craig Tooley said that this could extend the life of the mission by a year. (The spacecraft has a planned one-year life span, followed by a two-year extended science mission. I interpret Tooley’s remarks to mean that it could continue orbiting for a fourth year.) I would think that the extra time would be especially valuable for the narrow-angle camera, which can only image about 10 percent of the moon in any given year. I asked Sam Lawrence, of the LRO camera team, whether they had felt under any pressure to get the pictures of the Apollo landing sites out early. He said, “I won’t lie to you. Several people in Headquarters simultaneously and independently came up with the idea of taking pictures of the Apollo landing sites. But Isaac Newton is in the driver’s seat. It was largely serendipity that we happened to be in the right place to image them.” In fact, the Apollo 12 landing site has not been imaged yet, but it should come around into the camera’s view in a couple of weeks. There was lots of Twittering going on at this conference. I sat behind someone whose laptop had a screen full of twitters. I have so far refused to get on twitter.com, but those of you who are might want to check out what the scientists are twittering about. 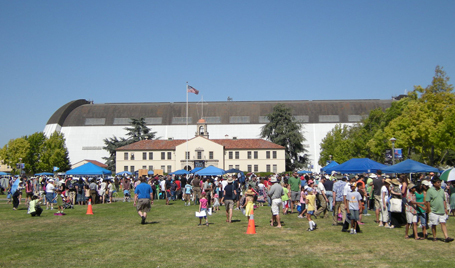 Yesterday I went to the Moon Fest at Ames Research Center, one of the events that NASA has organized in honor of the anniversary of the first moon landing. In every way except one, the afternoon left me very optimistic about the future of space travel. First, one thing that impressed me was that there was a big crowd. This wasn’t “book reading at the bookstore” big or even “Friday night at the movie theater” big. It was “sports event” big, with a traffic jam waiting to get off the highway, traffic cops showing people where to park, etc. I would guess that at least a couple thousand people came. That’s pretty exciting — a couple thousand people for a science event! And here’s another girl learning about angular momentum. She is standing on a rotating platform. 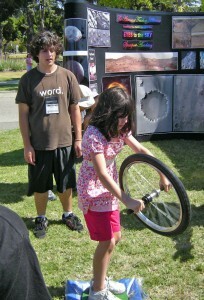 When she tilted the spinning bicycle wheel, the conservation of angular momentum caused her to start spinning around. For adults or more seriously minded folks, there was also a big tent set up for lectures. I got there in time for a lecture by Tony Colaprete, the principal investigator for the LCROSS mission. I did a short interview with him afterwards, which I will write about in a future post. Again, the size of the crowd was very respectable, probably at least 300 people. Astronauts are the closest thing that NASA has to rock stars. The questions after all the other talks were asked by adults, but after Donald Pettit’s talk the kids couldn’t wait to ask questions. They wanted to know how germs work in outer space, how long it takes you to get over your “sea legs” (or “space legs”) after you get back home, and how old you have to be to be an astronaut. Pettit’s answer to that last question surprised me. He said there is no age limit, minimum or maximum. BUT most of the space shuttle and space station astronauts these days are scientists, which means they have to get a science degree and they have to make some kind of impression with their research. So the typical astronaut these days is in his or her late 30′s or early 40′s. That was older than I would have expected. By the way, I hope the kids caught the subtext of Pettit’s answer: You want to be an astronaut? Study science. Pettit’s talk had lots of great video clips. He showed a simple gadget he invented for drinking tea in outer space, and he showed himself “eating” blobs of tea with chopsticks. He showed a film of sunrise as seen from the space station: from full darkness to full sunrise in seven and a half seconds! He showed how they recycle urine (“yesterday’s coffee”) so that you can drink it again (“today’s coffee”). His talk was light-hearted (“In space, you get to play with your food and call it science,” he said) but at the same time he did not miss any opportunities to point out that the knowledge we are gaining will be important to us as we continue to voyage in space. For example, recycling every little bit of water that we can will be vital in the nearly anhydrous environment of the moon or Mars. Over and over, Pettit emphasized that “strange things happen at frontiers.” And that’s why we want to go to frontiers, because that is where we can discover new things and see the world in new ways. So, as I said, I came back from the Moon Fest feeling good about space science. The public interest is real, if you can engage it. I felt as if NASA is doing wonderfully with its educational mission. In the 1960s they could never have pulled off an event like this. Also, NASA still has a corps of talented and charismatic astronauts, like Donald Pettit, who can make a passionate case for why space is important. And there is still a whole universe out there of things to be discovered. There’s only one thing missing from this picture. You’ve got the enthusiasm, you’ve got the talent, you’ve got the unexplored frontier – but you need to have a mission. You need something for all these people to get excited about. You need a challenge that is worthy of the talents of the astronauts and the scientists and the huge support staff behind them. The Shuttle is good … but it’s retiring soon. A couple years from now, for the first time since the 1970s, the United States won’t have any spacecraft capable of taking humans into space. The next time Donald Pettit goes into orbit, he will have to hitch a ride with the Russians. The Space Station is great … but just a little bit too ordinary. I don’t think that it inspires very many people. There’s only one mission that NASA ever had that was transcendent, and that was going to the moon. So that’s the missing piece. All of NASA’s literature still talks about returning to the moon by 2020, but I am far from convinced that it will happen. It will take leadership to stay the course, and I still haven’t seen the proof that our current leadership is committed enough to it. But we’ll see! Hopefully, when the 50th anniversary of Neil Armstrong’s “one small step” rolls around, we will either have people on the moon or we will have plans to get them there in the very near future.